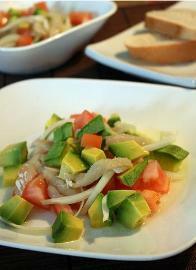 Gazpacho de Bacalao (Salted Codfish Gazpacho) - Tienditadepuertorico.com - Buy Puertorican Food Here!! In large serving bowl, mix all ingredients together minus avocado. Taste and reseason if necessary. Top with avocado when serving.